Durango artist Brad Kachnowicz takes a moment from working on one of his painting on Wednesday in his studio. Editors note: Profiles in Art is a new series by Herald contributing writer Stew Mosberg. Each month, Profiles in Art will focus on one person living in Durango who has a significant influence within our art community. This month Mosberg highlights the work of painter Bradley Kachnowicz. Growing up in Wisconsin, Bradley Kachnowicz (pronounced Koshnovitz) knew he was on his way to being a professional artist when he sold some of his artwork at the age of 8, albeit at his own makeshift art stand, and then again at age 12 when he won an art show medal. By his early teens he was commissioned for his first formal art piece; a sunset for his martial arts instructor. Kachnowicz concedes that his earliest influences and inspiration came from seeing art by Monet, Chagall, Bonnard and Tamayo, and it is evident in his work today when you see its vivid colors, symbolism and blend of abstract expressionism and semi-representational compositions. In college, Kachnowicz studied forestry and wildlife biology, the latter of which drives his subject matter today. A stint at art studies bored him but didnt diminish his aspirations. His work is probably familiar to locals through his exhibits at the Durango Arts Center, St. Marks Church, the Cortez Cultural Center and at Wildflower Studio 55 on Main Avenue. His canvases are also on view in Vail at Cogswell Gallery and more recently at Arroyo Gallery, on Canyon Road in Santa Fe. After graduating from the University of Wisconsin, Kachnowicz moved to Florida and worked there for 18 years, at which time he exhibited at numerous locations on the Gulf Coast including St. Petersburg, Tampa and Sarasota, as well as in Orlando. With his reputation growing across several state lines, he is establishing himself as a national entity, and with good reason  people like his work. Kachnowicz has worked in a variety of mediums including watercolor, pastel and acrylic, but has now switched almost exclusively to large canvases using oil paints, but not just straight from the tube oils; he combines a mixture of acrylic, oils and fiber, and then layers color, substance and texture onto the surface. The resulting heavy-laden work evokes a deeply emotional impact for the viewer and visually, as well as viscerally, draws them in. 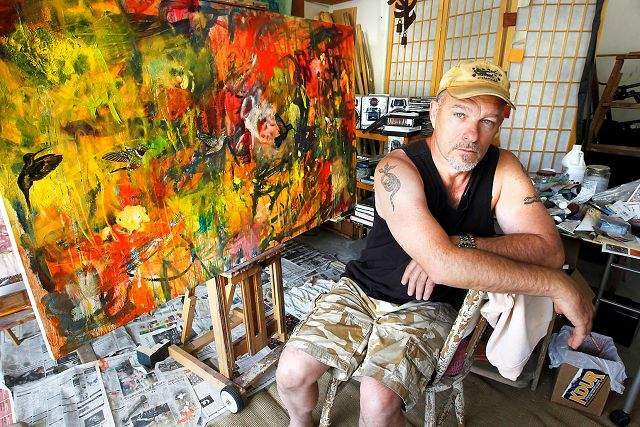 His garage studio is crammed with art paraphernalia jumbled together with his motorcycle, bicycle and several easels with canvases in various stages of execution. Watching him work is a study in dynamics as he reaches, crouches, stretches and steps in and out, driving the brush from one side to the other, scraping paint, adding or subtracting pigment. His trusty dog Raven sleeps sprawled in the driveway; neighbors pets congregate across the paint-splattered floor. When asked to, he willingly describes his process. Once these frenetic backgrounds cover most of the piece, he may then add meticulously rendered butterflies, as many as 50 in one painting, or hummingbirds, flowers or even his dogs. And while the work comes together as if planned, he readily admits to an element of accident. A fascinating conversationalist with a wide range of interests, Kachnowicz looks directly at you with piercing blue eyes and gives a wry smile. He is cerebral without being moralistic, and possesses a dry wit that can easily catch a visitor off guard. His introspection may have grown out of the numerous books he reads or the meditation he practices at regular intervals. His movements are fluid and catlike, possibly the result of his Tai Chi and Che Gong training. Whatever inner turmoil he may feel is only apparent in the background of his paintings. The thought process that goes into his work may be on an unconscious level so much so that when he approaches the blank canvas he has more likely than not already conceived of where he wants to go. He doesnt draw or sketch the idea out like some artists, but instead proceeds headlong into his layering process. Painting is an extension of meditation, in that Im in it (the moment), he said. When asked about how he hopes to evolve as an artist, the response is more about output than style. That is no pipe dream. He often has commissions, and regularly sells one or two pieces a month in the galleries. To achieve that objective is his way of gaining freedom. Freedom to do what I want, when I want, it is what I enjoy most in life. he said. To see more of Kachnowicz work, visit www.bkachnowicz.com.